Next years Art & Faith Creative Retreat in France & Belgium will be in the springtime! 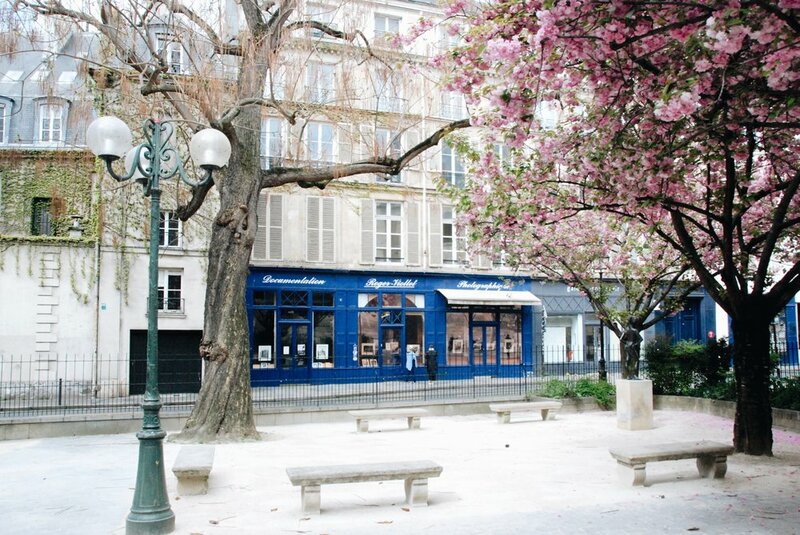 We just love it when the cherry blossoms are in bloom and the weather is so beautiful in Paris again. So we really felt this was the year to switch things up a bit and have our retreat at that time of year instead of the summer. I took the photo above in early April 2017 when Rebecca and I went to Paris and Brugge to plan out our retreat. Just look at these photos Rebecca and I took when we were there in April and tell me this isn’t the most beautiful time of year there?! Easter 2020 is on April 12th. Do you want the retreat to include Easter and we can enjoy a beautiful celebration there as a group. Would you rather us end the retreat before Easter so you can be home with friends and family? We really want to take things into consideration and see what is the consensus on this. We are thinking it will be 10 days and we can start it on April 1st and be finished by April 10 so you can fly home the day before Easter, or we can include Easter and you can fly home on the Monday after Easter, which is usually a Holiday anyways. Would love to hear feedback before we set the dates and pricing. We also like to give about a year notice of our retreats so you can plan, save and make payments. We want to add a BIG GIVEAWAY! Follow us on IG at Artandfaithcreative. Leave a comment on the post with the photo above and let us know if you’d love to join us in Paris in the Springtime, and if you would like to include Easter or be home by Easter. Tag a friend you’d love to go on this trip with! We will give it a week for the Giveaway and announce 1 lucky winner on Thursday, April 11, AND HER FRIEND that she tagged! They will BOTH receive $300 off their registration towards a 2020 Art & Faith Creative Retreat! It can be redeemed toward any one of the 3 that we are hosting next year! And, if you win and aren’t able to join us and take advantage of this discount, we will send you a lovely gift straight from Paris as a “next best thing” to remind you of beautiful Paris in the Springtime! Sound like a fun GIVEAWAY?? and we can’t wait to share more of the details on this trip SOON! So let us know what you think and we really pray that the Lord will direct our steps for this retreat in such incredible places like France & Belgium in 2020! Thank you again to everyone who has joined us through the years, and many of you over and over again! We know it’s a unique type of retreat when you gather women of faith together and ask the Lord to direct each step of it. We have seen lives changed and the JOY of the Lord brought back to women at these retreats. We are in awe of our God! We know He wants us to draw closer to Him and see what His PURPOSE is for our lives, and when we take a step away on retreats like these to “be still” and open ourselves up to what He has for us, He is always there to show us!